This is the story behind my Guinness World Record™ for the Most vinyl records smashed in 30 seconds. New Zealand media explored the obvious double meaning here: smashing vinyl records and breaking world records. The truth was I did both. It took me weeks to accumulate enough old vinyl records to make this attempt. In the second hand shop, I flexed each one and inspected them carefully. None of the records I was going to use could be damaged in any way, and I was checking to make sure none had hairline cracks running across them. And, of great importance to lovers of bygone days' music, I was strictly told I was not to break any records of old classics. I obeyed. Having found a large enough heap – which, incidentally weighed a great deal, I began practising. To show that I am not completely mad - just partially insane, I wore a pair of goggles. It was important to me not to stab myself in the eye with a razor sharp shard of the vinyl, shooting out at terrific speed. These bits were extremely sharp and would pierce my fingers without any trouble. The broken pieces resembled chipped obsidian: shining and smooth, but dangerous. From behind my goggles, I practised repeatedly. Thankfully I didn't get hit in the face, but I did feel pin pricks on my neck while smashing records as fast as I could. I can only presume these were flying slithers of vinyl that may have lodged in my face had I not been wearing the plastic shield. I was confident that I'd taken care of myself so I practised with gusto. 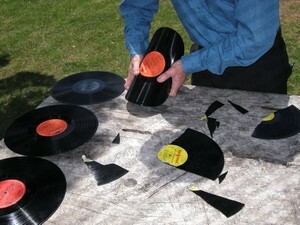 Every time, fine pieces of vinyl shot into the grass which I then had to search for and clean up. All this effort made practising hard work. Yet, I wasn't deterred because I might get a world record certificate if I could prove I was the best. That was my intention. On the aeroplane, while flying down to the TV studio, I flexed my wrists continuously. The formally dressed passenger alongside me thought I was very strange. We exchanged no glances except for when I caught him staring at me with moronic intensity. Nevertheless, we did interact somewhat. The air hostess passed, serving a light meal which we both accepted. Included was a small pastry. As you may know, it is difficult to eat one of these flaky things without messing a single flake. Half a rice grain-sized piece of the cream-coloured pastry landed on this man's knee. I didn't notice it until I saw him - using deliberate effort – begin wiping his suit with strained and perfectly repetitive hand motions. He did this unnaturally slowly, so as to draw my attention to the unacceptable inconvenience I had caused in his life. I felt like collecting every pastry on board and dumping it all over his head. But, needing to focus on my imminent world record challenge, I once again began paying attention to what was really important: wriggling my wrists. The man next to me continued staring out of the extreme corner of his eye with a gaze that made me think his eyeball was about to pop out for a better view. It was great to land because I could be myself again. First, I did a few star jumps in the arrivals terminal to freshen up, then I clutched my heavy bag and went searching for the lady who was due to meet me. Within minutes we'd driven into the car park at the TV offices. I unpacked and was soon ready to face the stopwatch. I had laid out all the vinyl records, spaced correctly, having taken a multitude of seemingly irrelevant little details into consideration. I strapped on my goggles, wiped my hands across my shirt and breathed in. The timekeeper was waiting for my signal and the TV film crew had all their attention on me. I nodded. The timekeeper counted down and I leapt forward. Now those wrists of mine were going to work hard. I snatched the first vinyl record and twisted both wrists so the vinyl smashed with a loud crack. From practising in neighbourhoods where walls had caused echoes, I knew this was sounding similar to a light rifle. I liked that. Shards flew; the presenter and her assistants stood back. Each vinyl record exploded with similar intensity and, in slow motion to me, it seemed that my touch was enough to detonate each. I'd worked out that of the three methods I discovered to smash a vinyl record, the one which worked best was that which required the greatest wrist rotation. Thankfully I had prepared my wrists thoroughly. And those around me could see it. This was like popping balloons; as I touched one, it shattered loudly – gone. I was enjoying the sensation of being master over every vinyl record, ridding the table of each. Oh yes! The only negative was that my wrists were getting tired because, somehow, some rather tough and flexible records had found their way into my collection. Two of these took great effort to break and put a lot of strain on my wrists which I needed to swing almost right round. My wrists were supple, though, and I could manage. I was pleased, since my world record attempt was being recorded for TV. Succeeding at this world record was fantastic. Media jumped on the story. I was portrayed as a record breaker, a man breaking records, someone with many records to his name – you say it, they probably applied it to me. Its actually deeply satisfying to read these glowing comments about oneself in newspapers and on the internet, I should add, so I was loving it. But, like everything else, the praise and commentary fizzled out soon because the world is producing stories constantly. For the time my work was in the media, though, it made me feel great.